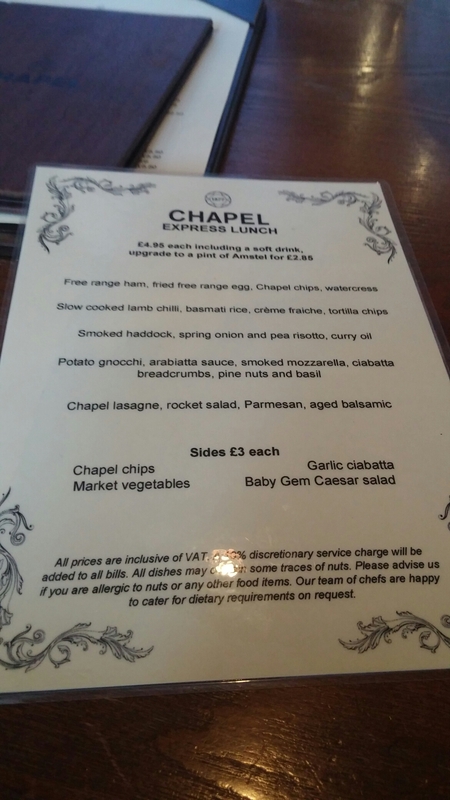 Now that’s a real meal deal – the £4.95 lunch menu at the Chapel 1877 bar & restaurant. 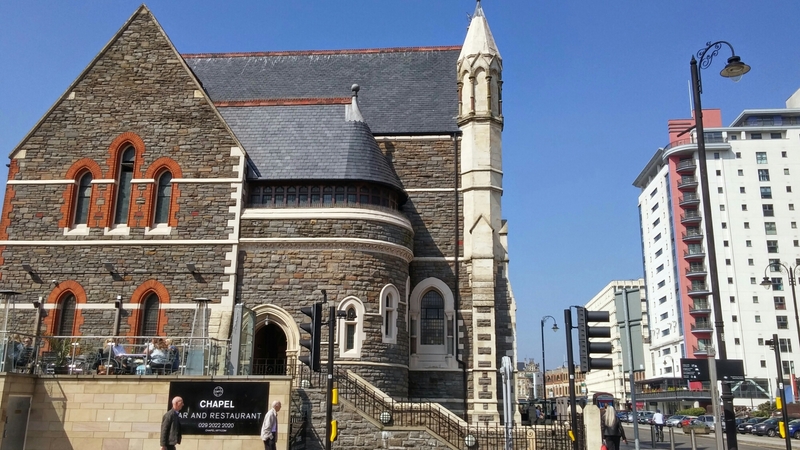 I have previously taken a look at lunch at the Chapel 1877 bar & restaurant in Cardiff on the blog and was quite happy with what I got and the price I paid. I, however, love a bargain and my interest was piqued in terms of a return visit when l saw that they had a new(ish) “express lunch” menu offering various dishes, plus a soft drink, for the cheap as chips price of £4.95. I was curious as to what they could deliver for such a low price – would quality be compromised? I like a bargain, but cheap rubbish is still rubbish and a false economy in my opinion. which, whilst not as palatial as the lovely restaurant area, is still a very pleasant area to eat in. It is not your usually baguette and chips/crisps affair and it seems a fair bit of thought has gone into it. You certainly don’t expect slow cooked lamb chilli or potato gnocchi (with an Arrabiata/Arrabbiata sauce – spelling of it seems to be a point of debate, but it ain’t arabiatta as stated on the menu – smoked mozzarella, pine nuts and basil) on a menu at this price, as those are ingredients that do not come particularly cheap. 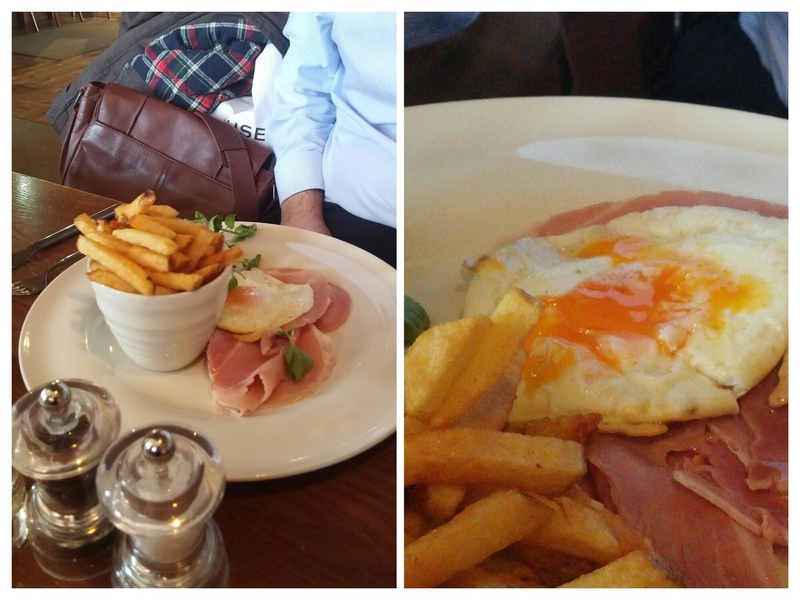 It all looked very promising as we ordered. This dish was surprisingly good with pillowy gnocchi and stretchy melted mozzarella that had a pleasing touch of smoke to it. 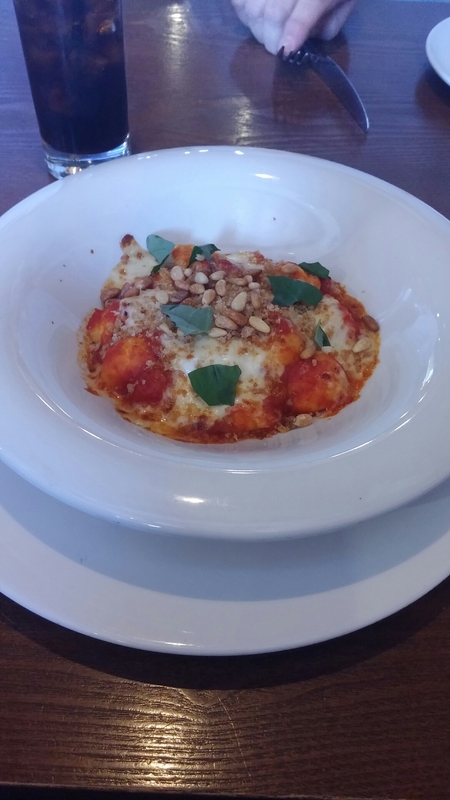 The pine nuts and toasted ciabatta crumbs on top added both flavour and welcome texture to the dish. My only complaint was the arrabiata sauce was a bit tame. Whilst nicely flavoured with fresh basil, it lacked the required chilli hit of a proper arrabiata (it after all means angry in Italian) sauce. There was also more than a hint of bog standard, rather than San Marzano or fresh, canned tomato about the sauce. For the price that is, however, understandable. I would suggest just calling it a marinara sauce, unless they zip it up a bit, with the required level of fresh chilli, to make it a proper arrabiata sauce. 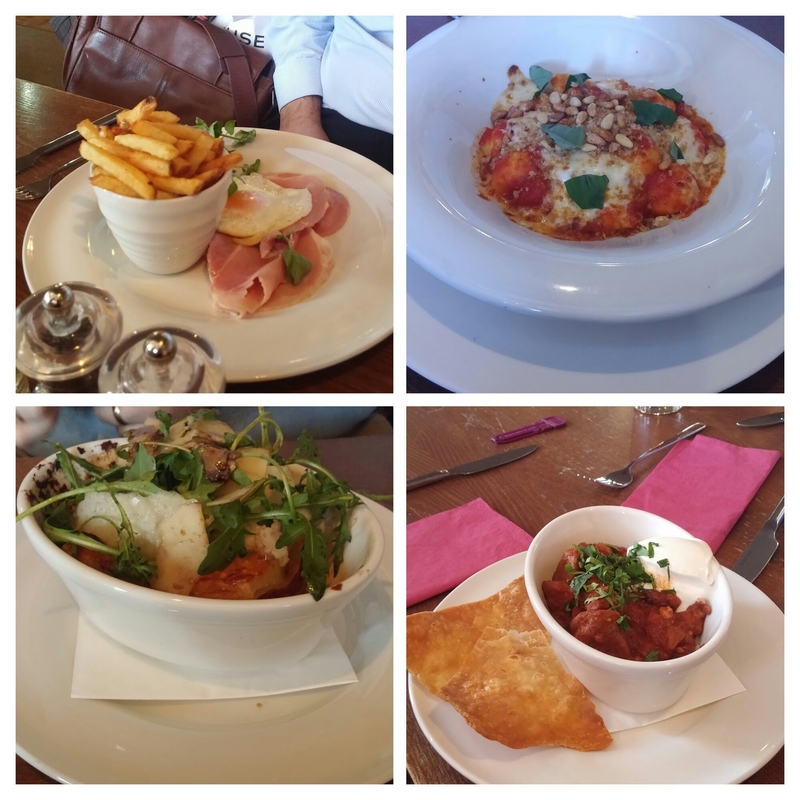 Other dishes ordered were a lamb chilli and, those bar meal classics, ham egg and chips and lasagna. 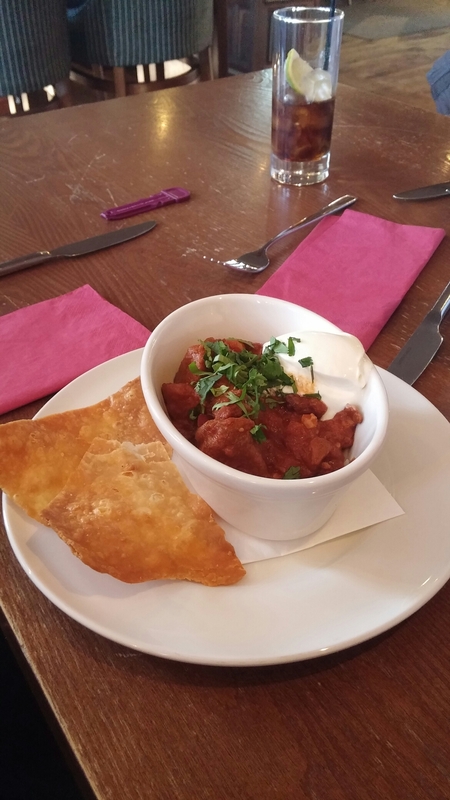 The chilli (with somewhat non conventional cubed lamb) came with basmati rice, tortilla chips and crème fraîche. It had a decent amount of spice to it, with the lamb delivering the slow cooked promise of tenderness. The rice wasn’t overcooked and the tortilla chips were homemade rather than out of a packet. Not a huge portion, but all in all pronounced as pretty good for the price. The “Chapel” lasagna also got a thumbs up, with a decent meat sauce to pasta ratio. The meat sauce itself was tasty and it was all topped off with a good bechamel. The only slightly odd thing here was the placing of the salad (rather nice with peppery rocket, a decent balsamic dressing and a generous amount of parmesan shavings) directly on top of the lasagna. This caused it to wilt somewhat and it would have been far better placed on the side. The final dish was probably the one that looked the best value for money (at least notional – ingredients costs meant it probably wasn’t), with a couple of thin cut, but decent looking, slices of proper ham (nice to see them avoiding the cheaper but revolting option of plastic ham), a properly runny egg (an absolute must for this dish for dunking chips into) and a very acceptable sized “pot” of french fry cut, crispy, chips. The collective view of this dish was that it was well executed and we had all paid a lot more for inferior versions elsewhere. 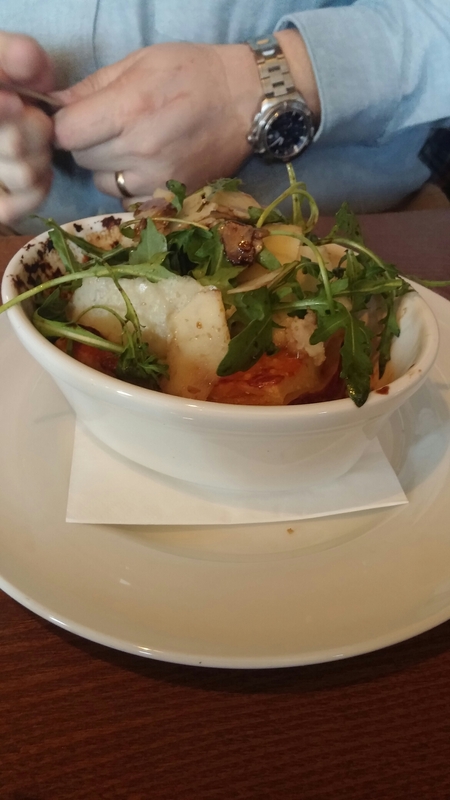 The only quibble with this dish was the presence of an entirely unnecessary watercress garnish. There is no need for this on a plate of ham, egg and chips and why places insist on adding garnish to everything is beyond me. 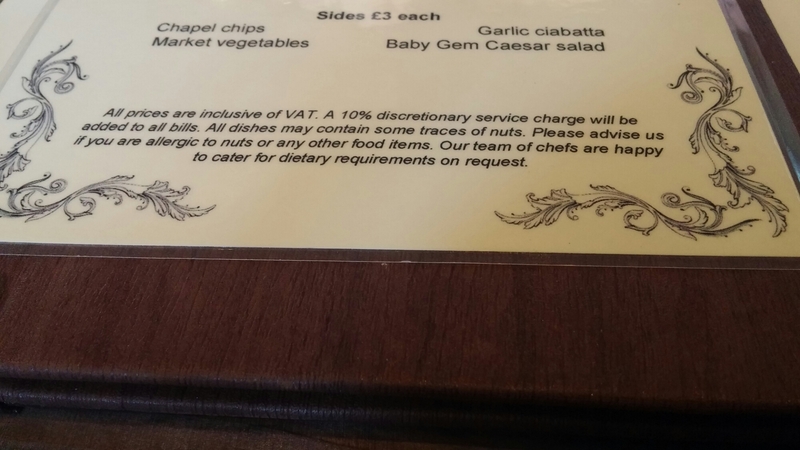 The £4.95 offer includes a soft drink and unsurprisingly the choice is fairly limited. You get a small glass of your usual suspects soda wise (coke, diet coke, clear lemonade etc). 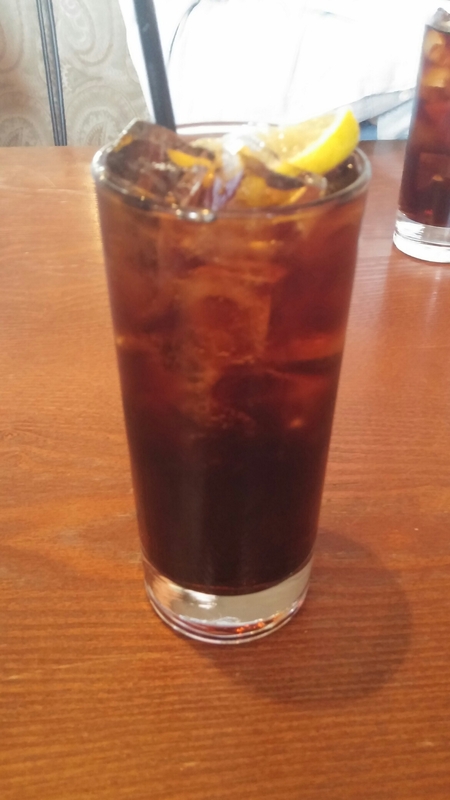 One of our party had a slight whinge about the proportion of ice to coke, but you can’t really blame them when you consider the price and I assume there is no reason why can’t ask for it with no ice. You can, should you so wish, upgrade to a pint of Amstel beer for an extra £2.85 – making the cost of food and a pint £7.80 (plus tip), which is pretty good. I have to say, based on the price, I was somewhat skeptical as to the quality of what would be delivered. When you factor in the likely costs (ingredients, staff cost, overheads,profits, the fact that you are eating in etc.) £4.95 is not much at all, but there really was no skimping on the quality of the ingredients here or in their cooking. Portions are not very big, but are fine for a light lunch. For the price I was very impressed. Sides are on offer if you want to beef up your meal and at £3 each allow lunch with a drink to come in at under £8. Still very good value I think and there is of course the option of sharing a side between 2 people. Couple of minor niggles. Firstly we were not given the express lunch menu when we first asked for the lunch menu (got given the two more expensive ones and we had to request from the waitress the express one). I assume this was an oversight, but if you don’t get given it initially make sure you ask for the “express lunch” menu. Secondly, they add an automatic service charge to the bill, which I don’t like. Here I would have happily paid 10% more plus a tip, but never like it when it is automatically added under the guise of it being discretionary. I always just pay the 10% in such cases, but would if not automatically applied be minded to be more generous if warranted. Have to say very minor niggles these. Would I go back? Definitely – this is what I regard as a real meal deal (so much better that the insipid sandwich deals the supermarkets provide). A veritable bargain and I was genuinely surprised with what they delivered for the very fair indeed £4.95 price. 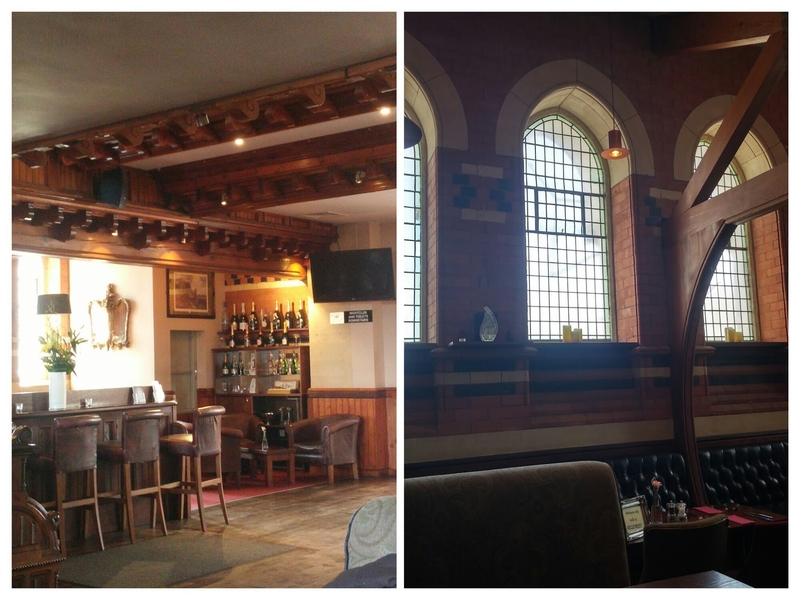 This entry was posted on Apr 3, 2016 by solicitingflavours in Beer, Cardiff, Cardiff restaurant, Chapel 1877, Chilli, Fixed Price Menu, lunch, lunchtime, Restaurant Review, review, Wales.